Ph.D.:Academy of the Pedagogical Sciences, Moscow, 1987. 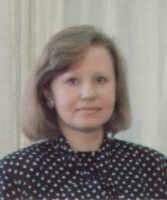 She was a assistent 1979-82 of the Chair of High Mathematics at Omsk Polytechnic Institute. During the years of 1982-for the present she is working in Omsk State University: she was assistent of the Chair of Algebra 1982-89, assistent of the Chair of Mathematical Modelling 1989-90, Assistent Professor of the Chair of Mathematical Modelling from 1990 and Associate Professor since 1991. Now she is Deputy of Head of Division. She taught lectures courses and seminars for undergraduate students on programming, pedagogics of mathematics, mathematical analysis. Fedorova has 38 published works. Fedorova has an interest in the areas of the teaching of the applied mathematics and programming for juniors and students. fedorova@univer.omsk.su - Click here to send email now!